Whilst engaged in another late evening search for rare crickets what was presumably the same Nightjar as that seen the previous evening was refound, Earlier in the day there was a decent arrival of around 50 Willow Warblers (mostly at the Long Pits). Three Mediterranean Gulls and five Yellow-legged Gulls were feeding offshore. At least six Porpoises were seen. A Jersey Tiger and three Holly Blues were seen in the trapping area but the moth trap was very poor. 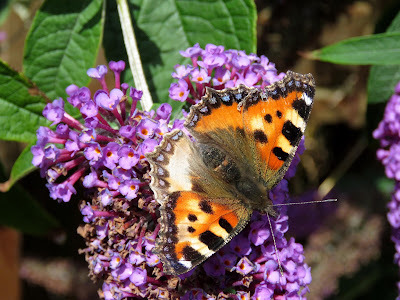 Good numbers of Small Tortoiseshells were seen around the Observatory and included this aberration. One male Small Red-eyed Damselfly was seen at the northern end of the spine on the top Long Pit. The search for crickets produced lots of singing and a few nymph Tree Crickets and three nymph Sickle-bearing Bush Crickets.